Boswell and Books: The Zelda Table, Which May be Late for The Opening of "The Great Gatsby", but is Just in Time for Our Event with R. Clifton Spargo, on Monday, June 10. The Zelda Table, Which May be Late for The Opening of "The Great Gatsby", but is Just in Time for Our Event with R. Clifton Spargo, on Monday, June 10. 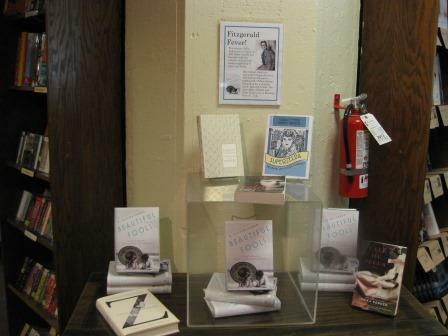 We've been juggling displays around the store, and realized we'd been remiss at putting up our F.Scott and Zelda Fitzgerald titles together. Now that The Great Gatsby has been released and is a hit, it's probably good for a couple more months. That's good, as our Fitzgerald event isn't until June 10 It's for former Marquette prof R. Clifton Spargo, whose novel, Beautiful Fools: The Last Affair of Zelda and Scott Fitzgerald been showing up in the various Fitzgerald roundups. Boswellian Jane has become quite the fan, talking it up to lots of folks. Ruth Scurr's column, "The Legend of Zelda" (of course), profiles several of the titles in The Wall Street Journal. Scurr noted what we have seen, that the book, at least Z, fall into The Paris Wife and Loving Frank trend of writing autobiographal "wife of" novels. She notes: "Zelda is a compelling, but problematic, candidate for a "wife of" novel. Soon after Hemingway met the Fitzgeralds for the first time in Paris in 1925, he noticed two kinds of jealousy in their marriage: Zelda was jealous of Scott's work, but Scott was also jealous of Zelda's vitality and charisma." Olivia Barker's review in USA Today makes the point that "Z is at its best as a parallel picture of not just a pioneering woman but a groundbreaking era. Popular culture tends to forget that for women, the '20s were nearly as epochal as the '60s. "You can hear more about Therese Anne Fowler's take on Zelda in this interview on NPR. One of the other titles profiled, Call me Zelda, is the follow up to Hemingway's Girl. I wonder how Hemingway and Fitzgerald would have felt about being forever linked by book clubs.Publishers Weekly wrote that Erica Robuck's novel "effectively captures the Fitzgeralds' turbulent marriage, as well as their inability to function personally or professionally beyond their jazz age heyday and into the Depression era. Regarding Spargo's novel, Julia Klein the Boston Globe says Beautiful Fools (the title derives from a Fitzgerald quote) is more narrowly focused, but almost as engrossing. Its narrative recreates a less than idyllic vacation that the couple took in Cuba in 1939, near the end of Fitzgerald’s life. Writing in third person, and alternating between Scott’s and Zelda’s perspectives, Spargo describes the imperfect communion of two troubled souls who can’t quite let go of their past or each other. One book that hasn't made it into all the roundups is Superzelda, a graphic novel from One Peace Books. Jeff Nilsson in The Saturday Evening Post (that exists?) reviewed the book, observing "author Tiziana Lo Porto and illustrator Daniele Marotta offer a view of Zelda that is not quite either of these pictures. They show a Zelda who knows her own mind, and is determined to live with as little compromising as possible. But their Zelda also desperately seeks her own artistic outlet as a writer, dancer, and painter, without ever quite succeeding. The book tries to separate Zelda the natural-born eccentric from the Zelda who spent the last decade of her life in and out of mental hospitals"
And if you want a biography instead of a novel, both Jane and Anne recommend Nancy Milford's Zelda. But Spargo's our man, because he's the one coming to Boswell. Mark your calendar for Monday, June 10, 7 pm, at Boswell. And perhaps you'll want to wear something from the new Gatsby collection at Brooks Brothers.